Sometimes setting records is not enough. Bishop Gorman’s Randall Cunningham II broke the oldest Zone/Region track and field record on the books on Friday at the Sunset Region meet at Silverado and still wasn’t satisifed. The junior cleared 7 feet in the high jump, breaking the mark of 6-10 set by Western’s Rod Smith in 1977. Cunningham, who has cleared 7-3 this season, missed on three attempts at 7-2. Another record came in the Sunrise girl’s shot put, where Liberty’s Ashlie Blake broke her own region mark of 47-9½ with a throw of 47-10¼. Blake already has a best of 51-3½ this season. It was Blake’s second meet win. The junior catpured the Sunrise discus on Wednesday. Liberty’s Reno Tuufuli also picked up a throwing double, winning the boys discus with a throw of 175-2 after winning the shot on Wednesday. 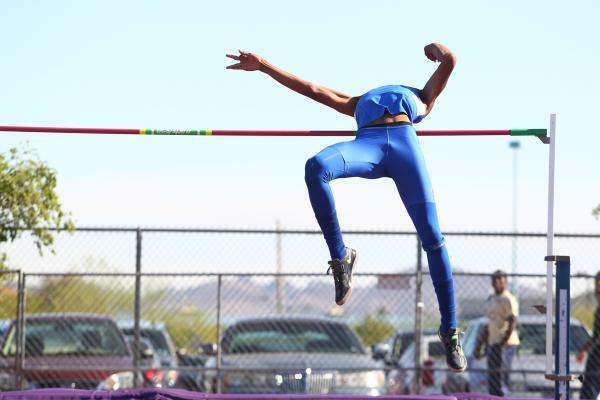 Cimarron-Memorial’s Kaycee Luke cleared 11 feet to set a Sunset Region record in the girls pole vault, and Valley’s Arphaxad Carroll missed setting the Sunrise boys long jump record by a quarter inch with his leap of 23-8½. Centennial came out as the big winner in the two running finals. The boys took the 3,200-meter relay (8 minutes, 2.96 seconds), winning easily over Desert Oasis (8:14.05) and Cimarron-Memorial (8:17.78). The other running final was the girl’s 3200. Centennial’s Sydney Badger led from the start and shattered her own Sunset record (11:11.82) set last year. Badger’s time of 10:56.49 was the fastest of the day. In the Sunrise, Silverado won the boys 3,200 relay in 8:08.71, and Coronado’s Sara Dort won the girls 3,200 (11:42.66).